Nanoparticles of Co0.5Ni0.5Fe2−xCexO4 (where x = 0.0, 0.01, 0.015 and 0.02) ferrites are prepared by the modified solution combustion method using a mixture of fuels and are characterized to understand their structural, microstructural and magnetic properties. The X-ray diffraction is used to confirm the formation of a single-phase cubic spinel structure. The average crystallite sizes are calculated using the Scherrer formula and are found to be less than 50 nm. The microstructural features are obtained by the scanning electron microscopy, and the compositional analysis is done by using the energy-dispersive spectroscopy. The transmission electron microscopy (TEM) investigations show that the synthesized ferrites are made up of very fine spherical nanoparticles. The influence of a rare-earth element (Ce3+) on the magnetic properties of the samples was studied using the Mössbauer spectroscopy. The Mössbauer spectroscopy reveals the formation of broadened Zeeman lines and quadrupole-split lines and the presence of the Fe3+ charge state at B sites in the samples. The quadrupole splitting shows that the orientation of the magnetic hyperfine field with respect to the principle axes of the electric field gradient was random. The magnetic hyperfine field values indicate that the A sites have more A-O-B superexchange interactions than the B sites. 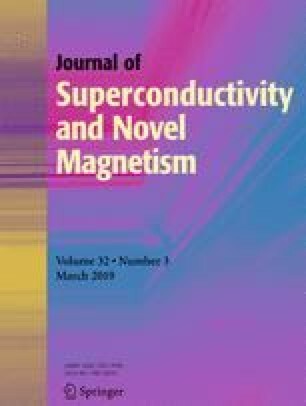 The coexistence of magnetic sextet and a doublet component on the room-temperature spectra suggests superparamagnetic properties of the nanoparticles. The low-temperature (15 K) Mössbauer spectroscopy explores the paramagnetic relaxation in the nanoparticles. The area under the sextet refers to Fe3+ concentrations in the tetrahedral and octahedral sites of the ferrite. This study confirms that the Ce3+ substitution of Fe3+ only for octahedron sites causes the decrease in Fe-O-Fe arrangement. The effect of Ce3+ doping on the magnetic properties of Co0.5Ni0.5Fe2O4 is examined from the vibrating sample magnetometry (VSM) spectra. Saturation magnetization values are decreased initially and then increased, as result of Ce3+ doping. This can be explained by Neel’s two-sub-lattice model. Further, the value of coercivity is found to be increasing with increasing Ce3+ concentration. The obtained results of M-H loop with improved coercivity (from 851 to 1039 Oe) by Ce3+ doping of Co0.5Ni0.5Fe2O4 demonstrate the usefulness for permanent magnet applications. The authors would like to express their sincere thanks to Ms. A. M. Tejashwini of the Department of Humanity, Vijayanagar College, Hospet, for her valuable input to increase the quality of the manuscript. This work was supported by the Ministry of Education and Science of the Russian Federation (Project No. 3.5346.2017/8.9).